In this lesson, we will learn how to use the transformation equations relating polar and Cartesian coordinates to convert points from polar to rectangular coordinates. Given that the polar coordinates of point 𝐴 are ( 4 , 1 2 0 ) ∘ , find the Cartesian coordinates of 𝐴 . Convert ( − 2 , 5 ) to polar coordinates. Give the angle in radians and round to three significant figures throughout. Answer the questions using the figure shown. 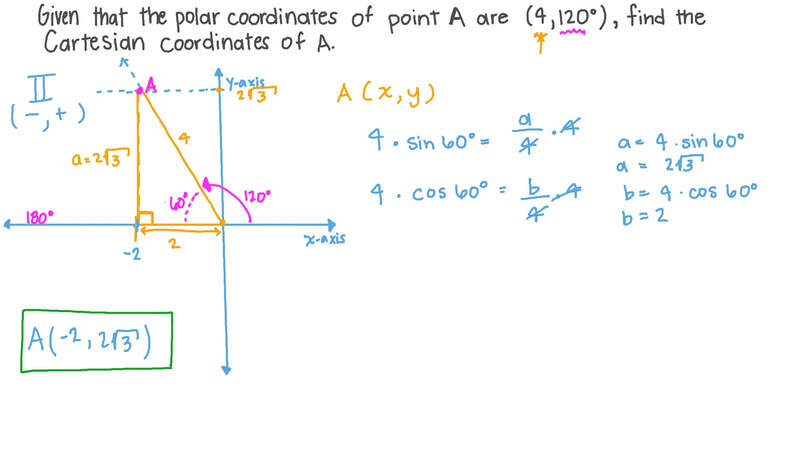 Which of the following are three possible pairs of polar coordinates for the marked point? What are the Cartesian coordinates of this point? Give these exactly. Consider the point 𝐴 with rectangular coordinates ( − 4 , 7 ) . Calculate the distance 𝑟 of this point from the origin. Give your answer in exact form. Find the angle 𝜃 that 𝑂 𝐴 makes with the positive 𝑥 -axis, giving your answer in radians to two decimal places. Given that point 𝐴 can be expressed in polar form as ( 𝑟 , 𝜃 ) , which of the following is also a legitimate polar form for point 𝐴 ? William and Hannah are learning about polar coordinates. They have been given the point 𝐴 , which is  4 , − 1 1 𝜋 6  , in polar coordinates, and the point 𝐵 ,  2 √ 3 , 2  , in rectangular coordinates. They would like to compare these two points. Hannah decides to convert point 𝐴 into rectangular coordinates. Determine the answer that Hannah will get. William decides to convert point 𝐵 into polar coordinates. He does his calculations and gets an answer of  4 , 𝜋 6  . Is his answer correct? William concludes that points 𝐴 and 𝐵 are different points, whereas Hannah concludes they are the same point. Who is correct? Which of the following statements represents a good learning point for William and Hannah as a result of this exercise? ARectangular coordinates are not unique representations for a point; there are many ways to express a point in rectangular coordinates. BPolar coordinates are not unique representations for a point; there are many ways to express a point in polar coordinates. Convert ( 2 , 3 ) to polar coordinates. Give the angle in degrees and round to three significant figures throughout. Given that the polar coordinates of point 𝐴 are ( 3 , 6 0 ) ∘ , find the Cartesian coordinates of 𝐴 . Given that the polar coordinates of point 𝐴 are ( 7 , − 1 2 0 ) ∘ , find the Cartesian coordinates of 𝐴 . Given that the polar coordinates of point 𝐴 are ( 6 , 1 5 0 ) ∘ , find the Cartesian coordinates of 𝐴 . Given that the polar coordinates of point 𝐴 are ( 1 , 1 5 0 ) ∘ , find the Cartesian coordinates of 𝐴 . Given that the polar coordinates of point 𝐴 are ( 5 , 3 0 ) ∘ , find the Cartesian coordinates of 𝐴 .